Modern Edinburgh Film School presents a screening and talk on the video and performance work of Edinburgh-based artist Catherine Street. This event forms a part of the exhibition Ripples on the Pond and its sister-essay, A Poetic Measurement, designed as a conversation between works on paper and moving image by women artists. 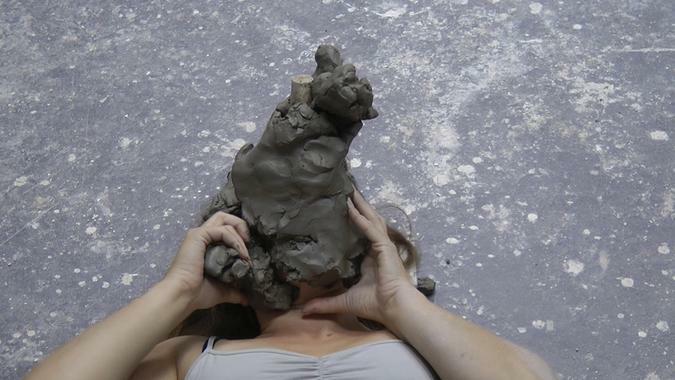 ‘Physical endurance, the limits of the body, its presence, performative and repetitive qualities alongside an erudite practice in spoken word readings and immersive installations categorize the work of artist Catherine Street.’ This event brings to focus selections from Street’s moving image, sound and performance repertoire, including The Mineral Mind (2014), The Hidden Physical (2015), and Sway & Muscle (2014), a period of sustained activity from a Creative Lab residency at CCA in 2013 to the Glasgow School of Art solo exhibition Muscle Theory (2015). Additionally Edinburgh-based poet Iain Morrison will present a reading that reflects on artists, the voice and text. Ripples on the Pond is an exhibition which has at its core works from the Glasgow Museums’ Collection. It takes as the starting point recent acquisitions from Glasgow Women’s Library’s 21 Revolutions series, relating them to other works in the collection and sparking questions about gender, themes and media choice in relation to women’s practice and visibility. Ripples on the Pond is a conversation between the works in the collection on paper and moving image with invitations to Modern Edinburgh Film School and LUX Scotland to programme artists screenings within and beyond the gallery space.